LAVAL, Que. - There's another space race underway — only this one isn't nearly as ominous as the Cold War competition between the United States and the Soviet Union in the 1960s to get a man on the moon. The new battle is between private companies that are working to get the space tourism industry off the ground this year. For Canadians dreaming about becoming a space tourist, that's good news because a price war appears to be going on. Space Expedition Corp. and XCor Aerospace signed a deal with Quebec travel agency Uniktour on Friday to offer suborbital flights to Quebecers. A similar deal is in the works for the rest of the Canadian market and is set to be announced in the coming days in Toronto. Uniktour president Philippe Bergeron is already booked for a suborbital flight this December, which could make him the first Canadian to experience the thrill. "I can't wait to see the black sky during in the day and I can't wait to see the curvature of the Earth and to be propelled by four rocket engines,'' he said Friday. "My seat is number 15 in the world and so far I should be the first Canadian to take part in a suborbital flight — if XCor is able to fly the first into space, which we think is a very nice possibility." Bergeron, 33, will travel in the pioneer Lynx Mark 1 space plane, which is still undergoing tests. Sylvain Belair, executive director of the Montreal-area Cosmodome space museum, where the announcement was made, is Uniktour's first customer to confirm his seat on board a flight in 2014. Space Expedition is offering two packages, with both including hotel stays and astronaut training. A trip in the Lynx Mark 1 space plane will cost US$95,000. It will take travellers about 60 kilometres above the Earth where they will experience weightlessness for three to four minutes during the 45-minute flight. The second package is for the Mark II and will cost US$100,000. That voyage will last 60 minutes and reach more than 100 kilometres above Earth. The weightlessness on that flight will last five to six minutes. The competition in the space race comes from Virgin Galactic. A flight on its SpaceShipTwo will cost $200,000 per person and the space shuttle will carry six passengers and two pilots. After being launched from a mother ship, the rocket plane would take space tourists about 110 kilometres above Earth — where they would also briefly experience weightlessness. 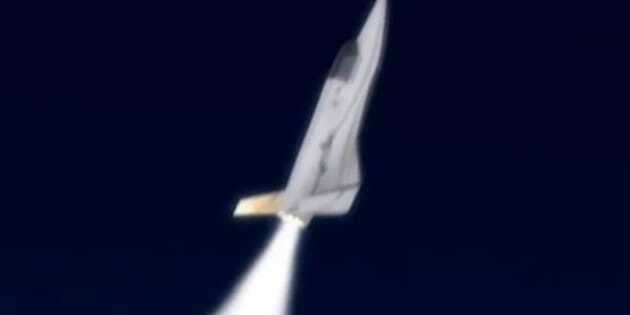 Virgin Galactic will launch out of Spaceport America, in the southern part of the New Mexico. The Lynx will blast off from spaceports in California's Mojave desert and Curacao, an island in the Caribbean sea just north of Venezuela. The Lynx space shuttle, which takes off like a commercial airliner, has room for a pilot and a passenger. Bergeron admitted the price of the package does not include airfare to the launch site. He said a regular return flight to the spaceport in California would cost about $600. Reinhard Spronk, Space Expedition's chief commercial officer, said his company eventually wants to have four space trips a day. "Virgin Galactic is one time per day," he added. "That's because they have to take out the engine overnight and put in a new engine." "We just keep our (reusable) engine in and it can be in operation 5,000 times." Spronk also noted that Virgin's space trip is a two-hour experience "because the first hour, the mother ship will take (passengers) up to 12 kilometres and then the rocket plane will go from there." "We start right away from the runway so we don't use a mother ship," he added. But the actual time spent being weightless in space in both cases is about the same. Greg Claxton, XCor's retail sales director, says travelling in the Lynx spaceplane is like being a real astronaut because the space tourist gets to act like a co-pilot and will have a view from a front window. "It's the real 'right-stuff' experience," he said. Claxton also pointed out that there's a medical check-up before space tourists are allowed to fly. "If you are claustrophobic or have heart problems, you will be excluded," he added. He said XCor is hoping to do its test flights this summer — "and if all goes well, it'd be great to start flights in the end of December or early in 2014."